For those born March 17, 1948. 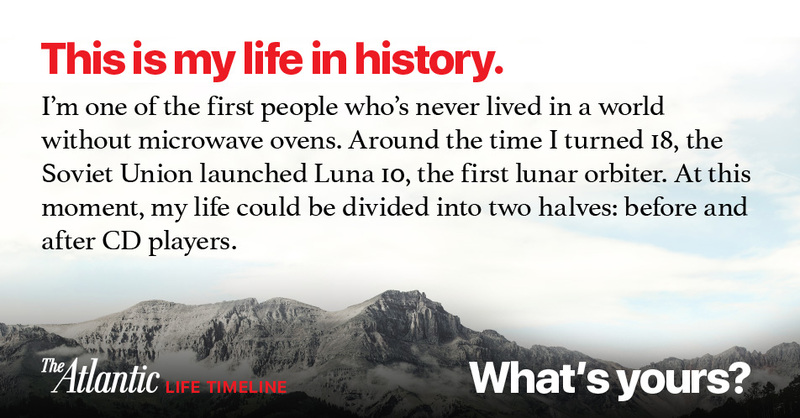 You're one of the first people who's never lived in a world without microwave ovens. In April 2014, Alexis C. Madrigal defended the microwave against the growing distaste of middle class cooks. You were born in March of 1948. This year, The Atlantic celebrates its 160th birthday, making it 2 times as old as you. The year you were born, An Anonymous Jewish American wrote about his decision to change his clearly Jewish name. Around the time you were born, the Soviet-backed Communist Party overthrew the democratic government of Czechoslovakia and began its 40-year rule of the country. In October 2013, Vladimir Dubinsky interviewed Anne Applebaum about the rise of communism in Eastern Europe after World War II. Around your 18th birthday, the Soviet Union launched Luna 10, the first lunar orbiter. In August 2016, Rebecca Boyle wrote about the race to the moon's resources. At 21 years old, you were alive to behold people walking on the moon. In 1978, Olivia Newton-John, who was born the same year as you, starred in the film Grease. In February 2016, Sophie Gilbert wrote about the live production of Grease. Your life can be divided into two halves: before and after CD players. In October 2012, Megan Garber wrote about the CD player turning 30 years old. When you turned 59, you watched humankind reach the outer solar system.